Project delivery is the complex task of ensuring an infrastructure project moves from design to reality, on-time and on-budget. Governments are investing in public transport at record levels to respond to population growth and the resultant strains on quality of life in communities. Public transport authorities face the challenge of delivering the transport infrastructure that is demanded by the community. In addition to securing funding and going through the process of planning approvals, it is vital to secure trusted partners from the private sector who can deliver infrastructure. As an expert in project delivery, Keolis Downer has the necessary skills, knowledge and processes to ensure a smooth transition from design to delivery, and in nurturing concepts and ambitions to realisation. In the light rail market in Australia, Keolis Downer has delivered and is delivering, key projects. 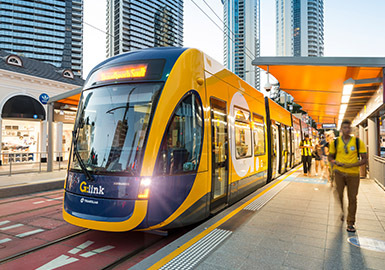 These include, in Melbourne, the commissioning and introduction of the E-Class trams and the overhaul of the Preston tram depot; and, together with our GoldLinQ partners, Phase 1 of the Gold Coast light rail (G:link), which was successfully launched in 2014. Phase 2 opened in December 2017 ahead of the Commonwealth Games. The E-Class trams are the latest generation of trams for Melbourne; built by Bombardier Transportation and largely assembled in Melbourne. Keolis Downer is playing a key role in commissioning, testing and introducing the first 50 of these trams onto the network by the end of 2017. We have used experts from Downer and Keolis to help oversee the process, bringing world leaders in rolling stock manufacturing and maintenance to Australia and New Zealand. This team is managing the introduction of the new fleet, the cascading of older trams to other lines on the network, and the embedding of best practice systems and processes. Light rail is undergoing regeneration. It is the fastest-growing form of public transport, with over 400 networks in operation. At the heart of this renaissance is the ability of light rail to move large numbers of passengers and to enable the renewal of urban landscapes. Keolis is one of the world’s largest and most successful bus and coach operators. It provides services in eight countries with a fleet of more than 23,500 vehicles. The Group’s bus fleet in Sweden runs entirely on alternative fuels and is 100% fossil free. Rail is in the DNA of Keolis and Downer. Keolis is a subsidiary of the world-leading French national rail operator SNCF. Downer is one of the pioneers of rail in Australia. Our pedigree as a rail operator reaches back more than 150 years, and our operations span three continents. Metro has been shown in research to provide the highest capacity transport solution for greater population densities. And from the perspective of customers, the speed, efficiency and amenity of a modern metro system ensures highly reliable and efficient service. Keolis not only operates metro, heavy rail, light rail, regular and high-frequency bus services but also manages bikes, cable cars, river/sea ferries, on-demand transport, private driver services and parking. Keolis Downer’s objective is to provide a seamless door-to-door journey. Keolis Downer offers communities multimodal transport solutions that are simple, efficient and seamless. By designing transport networks that people want to use, we break down barriers to passengers and therefore increase patronage. Keolis Downer has also reviewed and updated its Project Management System and appointed key staff to ensure capacity to deliver multiple projects. Keolis Downer is managing more than $250 million in projects on behalf of its client, Public Transport Victoria (PTV). PTV recently emphasised how crucial it is that their transport partners have the ability and the expertise to manage such projects. The E-Class trams project included the creation of a new depot in a heritage building in Preston and the closure of old East Preston depot. An added benefit for the Government from this project is that the East Preston site is available for the first time in over a century and can be redeveloped for residential and commercial purposes. The $200 million iconic Preston depot project is a key source of pride for Keolis Downer and its partners. Lessons from previous projects have been applied, and the depot features operations and maintenance capabilities. A yard management system, night servicing and planning have already been factored in for the larger trams we expect to procure after the E-Class. The site also features a tram driver simulator, which is an Australian first for safe driver training. The new depot opened in April 2016 and was designed with a whole-of-life focus, and with the knowledge that this will be a major transport asset for the state of Victoria for decades to come. On the Gold Coast, Keolis Downer is a key player in the GoldLinQ consortium, which was appointed to deliver G:link as a PPP in 2011. We applied our experience of developing 20 light rail systems in the past 15 years to ensure a successful launch. The early involvement of the operator was central to success on the Gold Coast and further ensured that the lessons of international projects could be transferred to Australia. The network was delivered on time and budget and is already exceeding expectations about patronage. It has also triggered a $6 billion surge of investment across the light rail corridor. Phase 2 opened in December 2017 ahead of the Commonwealth Games. Keolis Downer has proven expertise as both a project manager and operator with the capacity to coordinate whole-of-life asset management. These skills can be applied to transport projects in Australia and New Zealand. A key part of such discussions is the involvement of operators in the early pre-design phase. This reflects lessons gleaned from our experience in other jurisdictions.